Use GroVia Mighty Bubbles to strip buildup from minerals and urine in cloth diapers. 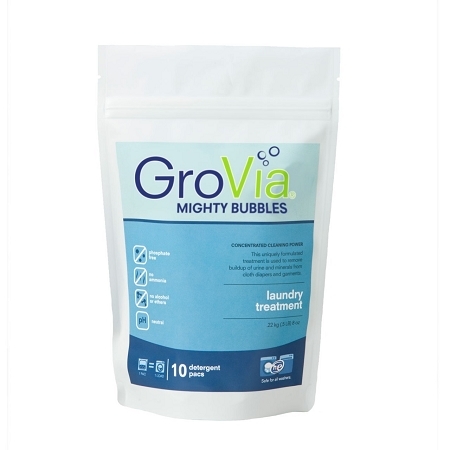 GroVia Mighty Bubbles is formulated to remove buildup of urine and minerals from cloth diapers and garments. 1. Place one pack in washer with diapers. No other detergent is needed. Run a regular HOT wash with one extra rinse. 2. Once diapers are clean, return to a simple wash routine that uses enough detergent. 3. May be used in addition to a normal wash routine every 6-8 weeks to keep your diapers clean and buildup-free. Ingredients: Sodium carbonate, Sodium percarbonate, Sodium polyitaconate, Surfactants, Enzymes, Oxygen bleach activator, Sodium silicate. We cannot ship this product outside of the USA except for military addresses. This stuff works SO well to clean diapers that haven't been washed properly. It also works really well on used clothes that you don't know the history of, old towels that need to be refreshed, etc. So many different uses and it's such a strong cleaner that I haven't had any issues. Highly recommend! STOP STRIPPING YOUR DIAPERS. Seriously. Stripping is hard on them, and this is just as good - or better! One pod will clear your stinkies, no problem. LOVE. Have this on hand always, IMO.